Show off your treasures behind the beautiful glass doors of one of our china cabinets! Designed to display all of your trinkets in both modern and rustic styles. 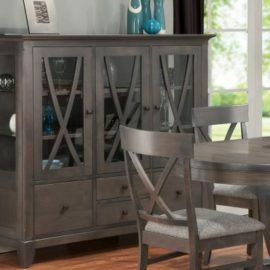 Configure yours so that it complements your dining set. Expert Mennonite and Amish craftsmen carefully construct each cabinet from solid wood. We’ll stain it to give you a rich luxurious finish you’ll treasure for years. Quality you can see the moment you enter our showroom because of their attention to detail. Craftsmanship that is backed by a lifetime warranty. We don’t just sell furniture; we craft future family heirlooms!